‘THE giant of Africa’ – call it one of Nigeria’s many accolades, an eulogy, an appraisal, a title, whatever you consider it to be, but it’s ‘un-debate-able’, that this phrase ‘The giant of Africa’ often accompanies the presence of the country Nigeria at different occasions and scenes both at national and international levels. Patriotic Nigerians within and beyond the length and breadth of this great continent “Africa” utter the phrase “Nigeria- the giant of Africa” over and over again with so much pride and excessive confidence. 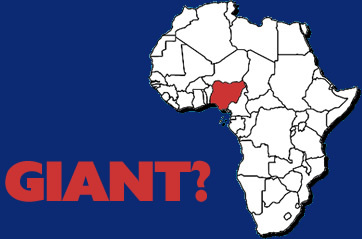 Now I ask: Does it excite you each time you hear Nigeria being referred to as ‘’the giant of Africa”? How well does it gladden you as a patriotic Nigerian each time you are reminded that you hail from the country- that is the only giant among the 53 other countries on the African soil? Well, I used to feel the excitement of being opportune to come from the root of the giant of a whole continent. And now I seek the permission of patriotic Nigerians, only patriotic Nigerians, to read along with me and discover the reasons why we “Nigerians” must stand up tall, bold and define Nigeria – The giant of Africa”, thereafter renounce this deceptive phrase ascribed to her. According to the New 8th Edition of The Oxford Advanced Learner’s Dictionary – International Student’s Edition which is widely accepted in Nigeria, a giant is defined as a very large and strong person who is often cruel and stupid—definition 1. A giant is also defined as a person who is very good at something—definition 4. Going by the definition 1 should we define Nigeria as the giant of Africa, as a very large and strong country that is cruel and stupid? Oh, yes, how best can we define Nigeria in her present state if not going by this definition, a country governed by cruel leaders and which is full of stupid acts? According to definition 4—a person who is very good at something, though a seemingly mild definition, not until you attribute to it the Nigerian factor, that it would be redefined as a 52 years old country that is very good at acts like terrorism, corruption, insincerity, heartlessness, offering bad standard of living, poor economy and presenting a flooded environment. Historically, it has been confirmed that good things and occurrences have never been and would not be associated with this creature—the GIANT. Many of the giants that have lived before now were no more than treats, objects of entertainment to their neighbourhood. They are not known to be useful to themselves and those who look up to them. Their generations never wanted to be associated with them. The giants, consequently, would rather remain tribeless because of the ignominy they may have brought that cannot be erased from record. Quoting from one of the Holy books another notorious tribe of giant was known as GATH. They were described as men of great stature, that had on every hand six fingers, and on every foot six toes, four and 20 in number; and were born to the giant, whose champion, Goliath, was humiliated. Until today, he remains an example in teaching respect and fear among the adult and instigating a brave nature in the little ones. Have you read about Argob? This was an island of mighty men with description “sixty walled cities in a space of 308 square miles. The architecture is ponderous and massive. Solid walls 4 feet thick, and stones on one another without cement; the roofs enormous slabs of basaltic rock, like iron; the doors and gates are of stone 18 inches thick, secured by ponderous bars. The land bears still the appearance of having been called the ‘land of giant ‘ under the giant Og.” I still wonder why “giant” should be as fearful as to construct a place with such description to live in. Zamzummim was also a race of giant; briefly described as “a people great, and many, and tall. Nigerians should not wait until we are branded with infamy. You may see this article as not comprehensive enough as to convince all patriotic Nigerians on why we must renounce as soon as possible the title: “The giant of Africa”- attached to our motherland, Nigeria. Then I urge you to go the extra mile, read more of tales of cruel beings – GIANTS, how useless they were to themselves and offered unnecessary and annoying services to their people and the type of hypocritical life they lived. Read between the lines and imagine how their ill-speeches enslaved their brethren, neighbours, destroyed their immediate environment and wasted their resources, with their feeble mind and cowardly yet hypocritical actions. While you see Nigeria as a country on the western portion of the African continent surrounded by other younger but more successful countries, I see a 00 km2 piece of land on which about 160 million unlucky creatures find themselves governed by unkind and inconsiderate people. While you see an exploration site with abundance of human and natural resources, I see a 52 years old giant whose speeches and actions have kept disappointing his people and messing them up in troubled, muddy waters for over five decades. Hmmm, as I watch “patriotic Nigerians” in their flashy green and white attires hopping and giggling from one tourist attraction to another event centre celebrating a 52 years old giant who is yet to conquer the least of his many life-threatening problems, I would rather put on the darkest of material from my scanty wardrobe, move to the street and, in sobriety, sob as one that mourns the dead. If a title must be attached to this country, Nigeria, it should not be a deceptive title that would relax the mind of an average citizen when there is fire descending from the mountains already. To those who deem it fit to paint Nigeria with accolades or titles they should rather come up with a better phrase that would send vital messages that would drive us to our desired destination. It should not be this deceptive and unworthy title: The giant of Africa. The time has come when Nigerians must rise in unity and renounce it with passion for a dream Nigeria, a land of happy people living in peace, in abundance, and an example to the other countries of the world. • Seyifunmi is a 400 level student, College of Environmental Resources Management, Federal University of Agriculture, Abeokuta. ← Before we ‘port’ to APC: Is Tinubu and Buhari really ready?